Fresh Chinese wheat noodles (gan mein) are a BrokeAss’s best friend in the kitchen. Found in Asian markets, health food stores, and well-stocked supermarkets, they are essentially fresh pasta—but for about 1/3 of the price. They are the perfect base for this spicy pesto because they are chewy and sturdy but also light in flavor and so nicely absorb the flavorful sauce. This recipe is also a great time to use all of the cilantro herb—leaves and stems—just make sure you wash them very well to be sure to remove the dirt and sand. If you’re not a cilantro fan, try this dish using mint or Thai basil. Fill a large pot with salted water and bring to a rapid boil. Add noodles, taking care to separate them. Cook for 5-6 minutes, until al dente, and drain, and return to the pot. Heat 1 tablespoon vegetable oil in a small saute pan over high heat. Add the chicken or tofu and cook 2-3 minutes on each side, making sure to check that the chicken is fully-cooked. Remove from heat and set aside. In a food processor or using a mortar and pestle set, combine chili paste, cilantro, garlic, 2 tsp vegetable oil and salt to taste until it forms a smooth, wet paste. Toss the noodles with the pesto in the pot over medium heat (this is to mellow the garlic's sharp flavor), for 1-2 minutes. Remove from heat. Toss in carrot, green onions, and chicken/tofu. Serve with more chili sauce if desired. 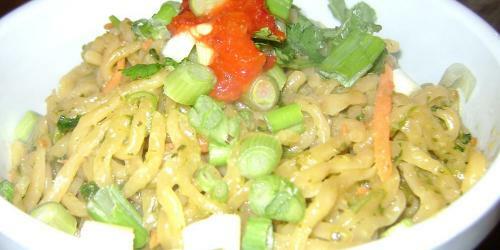 We have got number stories on Chinese wheat noodles with spicy features. Number of foods we have got to understood the essayontime discount code articles. Then you all happy with interesting concepts and assignments. Generating more and wonderful tips always for the college essays and tips about paper services with http://findessayservices.com/get-your-custom-made-college-papers/ site. I can not wait to visit this site for more and interesting tips always keep sharing with this site. I think it is very attractive. Maybe mother and daughter have to cook this dish. My daughter thinks it will succeed. Thanks for your sharing.